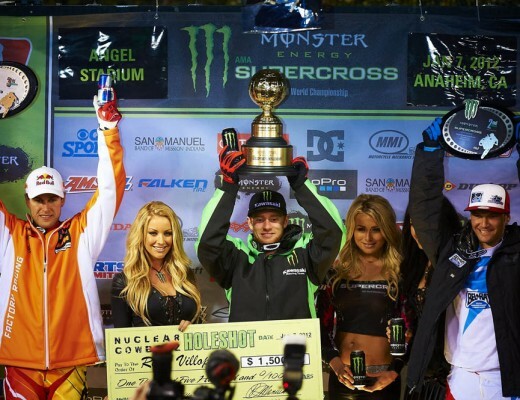 AURORA, Ill. (January 28, 2013) – After four races and three different 450SX Class winners, Monster Energy AMA Supercross, an FIM World Championship, returns to Angel Stadium this Saturday night for the 60th time. Current points leader Davi Millsaps, who won the season opener in Anaheim earlier this year aboard his Rockstar Energy Racing machine, has a seven point lead on Team Muscle Honda Muscle Milk’s Trey Canard and an eight point lead on Monster Energy Kawasaki’s Ryan Villopoto, the two-time defending champion. In the Western Regional 250SX Class, Red Bull KTM’s Ken Roczen moved into the points lead after winning his first race of the season last weekend in Oakland. This weekend’s race will air live on SPEED at 7:30 p.m. PT. Media day is Thursday, January 31 from Noon-2:00 p.m., featuring JGRMX/Toyota/Yamaha’s Josh Grant and Justin Brayton as well as Troy Lee Designs/Lucas Oil/Honda’s Cole Seely, Christian Craig and Jessy Nelson. 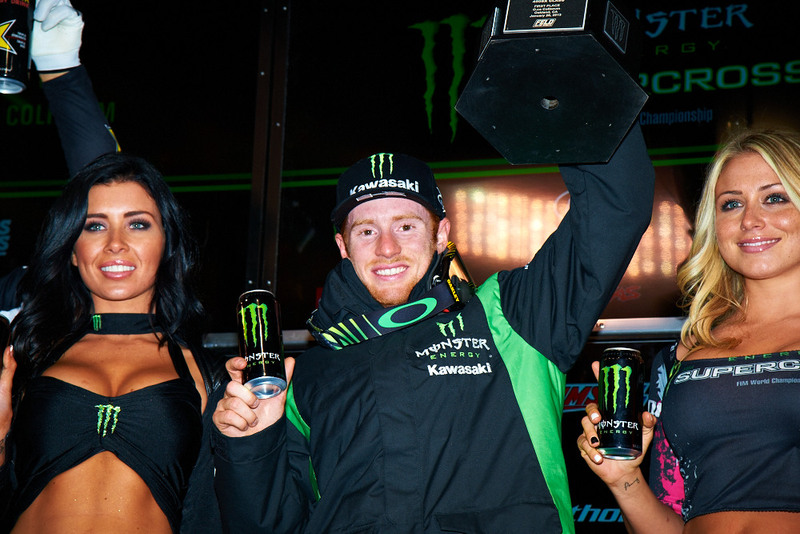 Villopoto became the first repeat winner in this parity-packed season and is quickly making up for his 16th-place finish at the season opener. Villopoto has five career wins at Angel Stadium and is hoping to win his third-consecutive race of the season this Saturday. Millsaps finished second in Oakland last weekend and controls the points race for the first time in his seven-year career. Red Bull KTM’s Ryan Dungey rounded out the podium with a third-place finish. In the early stages of the 450SX Class Main Event, a huge crash in turn two collected TwoTwo Motorsports’ Chad Reed, Yoshimura Suzuki’s James Stewart, Toyota/Yamaha/JGR’s Josh Grant, and Team Honda/Muscle Milk’s Justin Barcia. Stewart, Reed, and Grant re-entered the race near the back of the pack and Barcia was forced to withdraw from the race. In the 250SX Class’ Main Event, Roczen moved into the lead on Lap 11 and rode the third win of his career. Troy Lee Designs/Lucas Oil/Honda’s Cole Seely finished second and Rockstar Energy Racing’s Jason Anderson finished third. Roczen has an 11-point lead in the season point standings over Seely. GEICO Honda’s Eli Tomac, who came into Oakland with a nine-point lead in the championship and a three-race winning streak, crossed the finish line on the opening lap in eighth place. On the following lap, he re-entered the race in 18th place. On Lap 5, he crashed again in the whoops section and was unable to finish the race. He now sits third overall, 15 points out of the lead. At last Monster Energy Supercross race at Angel Stadium, Monster Energy Kawasaki’s Jake Weimer opened the 450SX Class Main Event with the Nuclear Cowboyz® Holeshot Award with Team Honda Muscle Milk teammates Justin Barcia and Trey Canard in tow. After a sixth-place start, Villopoto began to charge through the field, eventually passing Canard on Lap 5 for the lead and rode to victory. The first supercross race held in Anaheim was December 4, 1976, when Marty Smith won on a Honda. This weekend’s race will be the 60th time the gate will drop for a race in Anaheim in 38 years. James Stewart, Ricky Carmichael and Jeremy McGrath are tied on the all-time 450SX Class win list in Anaheim at eight. Ivan Tedesco holds the 250SX Class all-time win record in Anaheim with five wins. Tickets and pit passes are available at the Angel Stadium Box Office, all Ticketmaster Outlets, participating Yamaha Dealers, charge by phone at (800) 745-3000, or online at www.supercrossonline.com and www.ticketmaster.com. Practice and qualifying begin at 12:30 p.m. and the main event starts at 7:00 p.m. Tickets for adults or children are: Club Seats $85, Gold Circle $60, Price Level 3 $45, Price Level 4 $35 and SuperValue Seats $20. All seats are $5 more day of show. Pit Passes are available for purchase at the Angel Stadium Box Office or Ticketmaster.com for $10 or for FREE when they purchase at participating Yamaha Dealers or when they recycle a MONSTER Energy Can at the stadium’s Pit Entrance on race day from 12:30-6:00 p.m. Tickets are subject to convenience and handling charges and are $5 more on the day of the race. For more information on the Monster Energy AMA Supercross, an FIM World Championship, please log on to www.SupercrossOnline.com, the official website of Monster Energy Supercross. For all media requests, please contact Denny Hartwig dhartwig@feldinc.com or 630-566-6305. To follow Monster Energy Supercross on Facebook and Twitter, log on to http://www.facebook.com/supercrosslive and http://twitter.com/supercrosslive. Feld Motor Sports®, Inc. is the world leader in specialized arena and stadium-based motor sports entertainment. Feld Motor Sports, Inc. productions include Advance Auto Parts Monster Jam®, Monster Energy Supercross, AMSOIL Arenacross, Nuclear Cowboyz®, and IHRA® Nitro Jam®. Feld Motor Sports, Inc. is a division of Feld Entertainment, the world’s largest producer of live family entertainment. For more information on Feld Entertainment, visit www.feldentertainment.com.